Irvine Public Schools Foundation (IPSF), in partnership with Irvine Unified Council PTA (IUCPTA), hosted more than 150 guests at its annual Spirit of Community Awards on June 1, 2017 at Strawberry Farms Golf Club in Irvine. 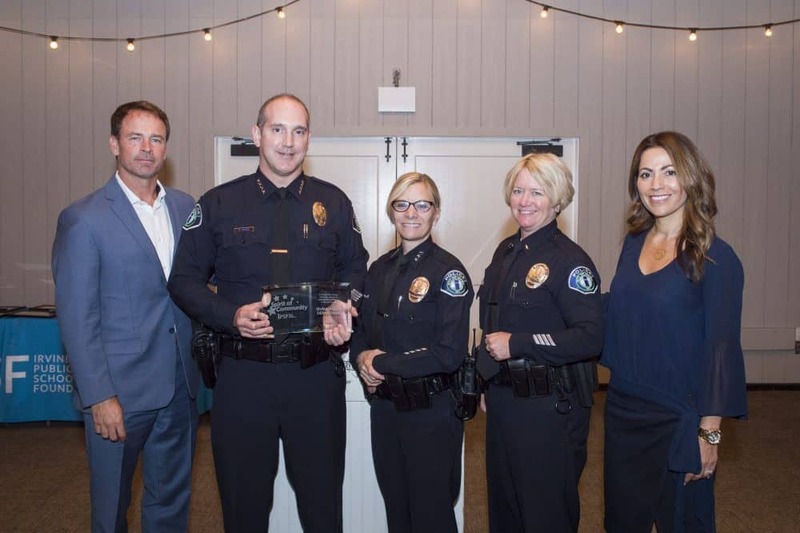 At the event, IPSF honored the Irvine Police Department for their outstanding contributions to educational excellence and impact in the Irvine community. Each year, the Irvine Police Department’s School Resource Officers work closely with the Irvine Unified School District to keep our schools safe through a number of programs including D.A.R.E., Violent Intruder Response Training, the Start Smart driving program for new drivers, and the Safe Routes to School Program which includes crossing guards, and onsite traffic flow plans. There are currently 11 full-time School Resource Officers and one sergeant dedicated to Irvine schools. These SRO’s are a direct link between Irvine’s youth and the Irvine Police Department, providing enforcement of the law and education on many topics.